As I mentioned in my last post, I’ve been building a reproduction of a sliding lid candle box in preparation for a class I am teaching on its construction in July. I’ve built these boxes before, but most are somewhat clunky in appearance if the sides of the box are made from material that is too thick. So I decided to experiment with the thickness, or rather thinness of the sides. So I started by planing all of the cherry stock for the project to just under 3/8″ thick. Planing the groove for the sliding lid with a Record #44 plow plane. 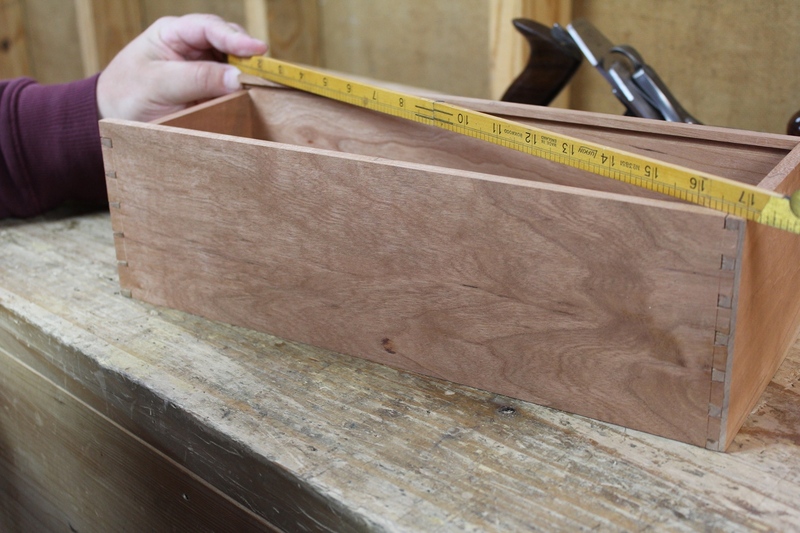 After sizing the stock, I plowed the grooves for the lid before moving on to the joinery. 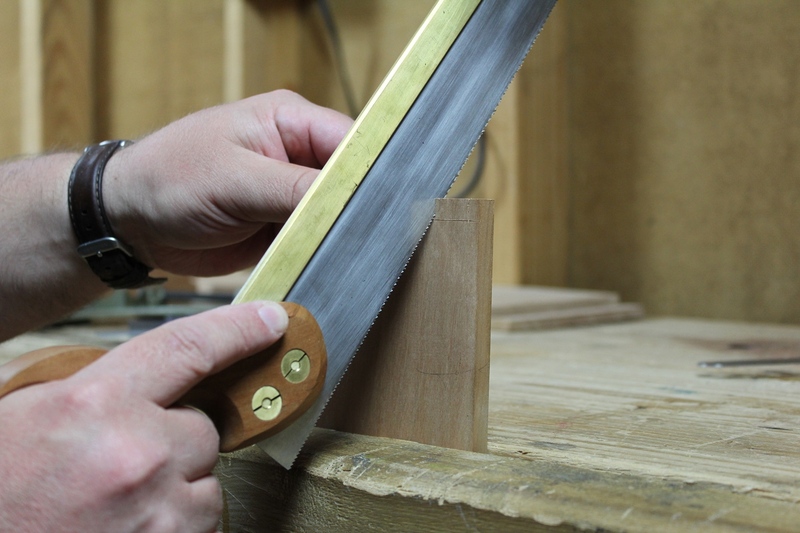 I’m using a 3/16″ blade and plowing the groove 3/16″ down from the top edge of the box. The groove is plowed a full 1/4″ thick, which requires a bit of care, because it only leaves 1/8″ of material at the bottom of the groove. This makes it very easy to split off the part above the groove if you’re not careful (I may have done this once). The groove is only plowed in three sides of the box – the two long side pieces and one end piece. The short side of the box is sized to come just to the bottom of the groove so that the lid will slide over it. Once the groove is located, I mark the location of its bottom on the remaining end of the box (the end without the groove). I then rip this end narrower and plane the edge to final dimension. This short end of the box needs to come only as high as the bottom of the groove on the long sides of the box so that the lid can slide over top of it to seal up the box’s contents. 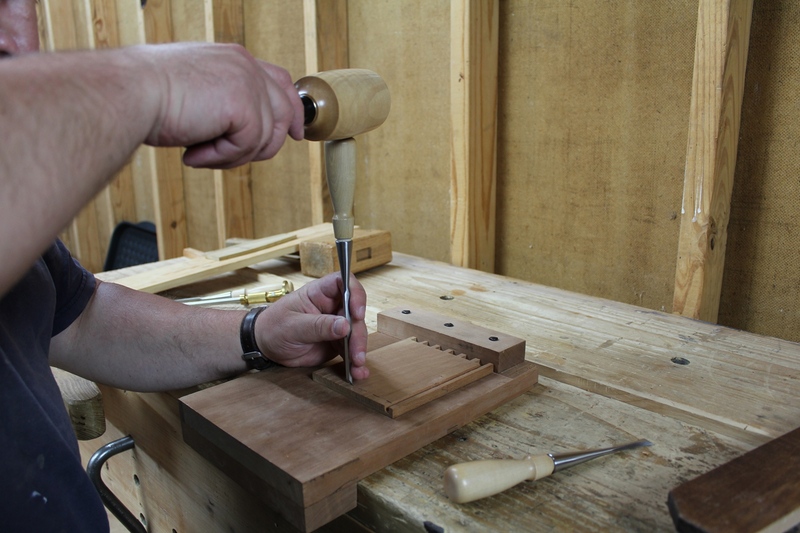 If you are familiar with how period drawers were made, the construction method is identical. 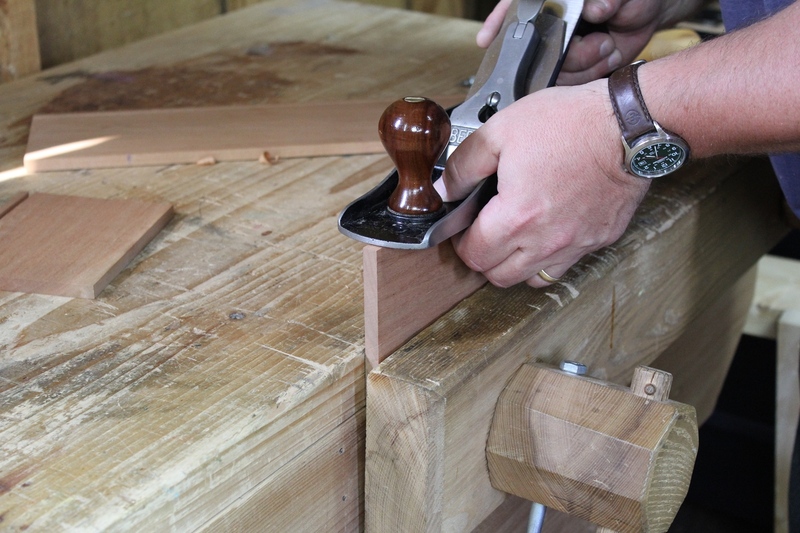 I mark the dovetail baselines with a gauge. 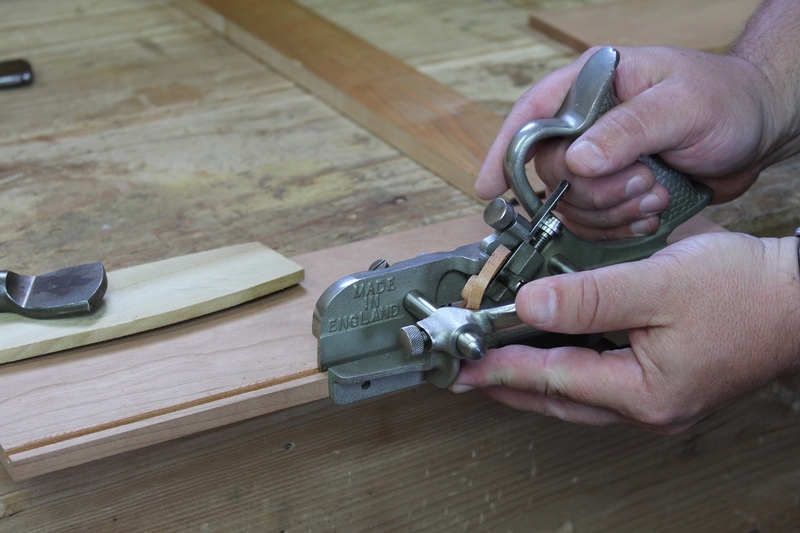 Using the bench hook makes it easy to hold the stock for gauging. Once the groove is plowed and the short end is sized, I mark out for the dovetails. 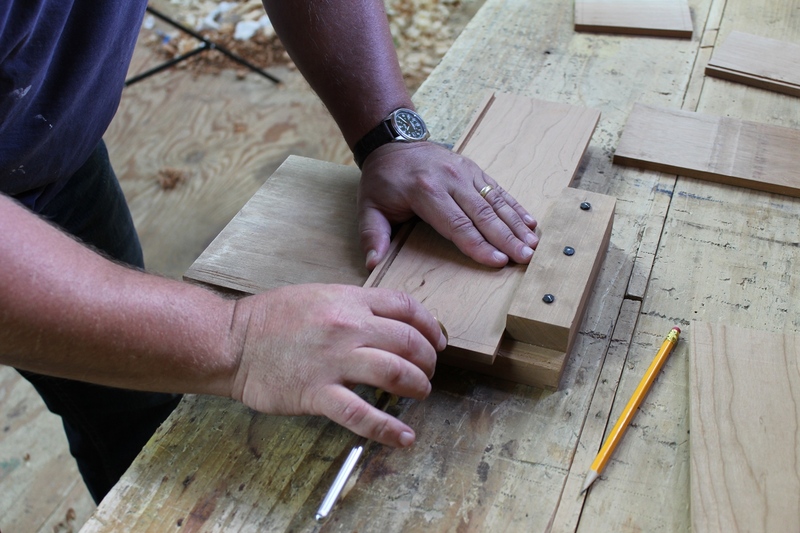 The end of the box with the groove will be joined with half blind dovetails, just like the front of a drawer. The end of the box without the groove (the short end) will get joined with through dovetails just like the rear of a drawer. The lid will then slide in just like the bottom of a drawer. Sawing the half blind tails. I spaced the tails using dividers and sawed them to the baseline. I laid out my tails so that the pins were quite small. They were so small in fact that it wasn’t even worth trying to saw them out. So I just chopped the waste out with a 1/8″ chisel. As the sides were just a hair under 3/8″ thick, chopping the waste out really just took a minute. I learned this trick for holding the stock while transferring the tails to the pin board years ago. Once the tails were all sawn and chopped, I transferred them to the pin board. Years ago I learned the technique of using corner clamps to hold the stock in place for the transfer. It works best if you use a clamp on each corner, however, my second clamp broke several years ago and I have not replaced it yet. This technique can be used whether you cut pins first or tails first. Because the stock is so thin, cutting the half blind pins goes quickly, because there’s not much to cut. Once the tails have been transferred to the pin board, the pins can be sawn. The half blind pins can obviously only be sawn partially through. 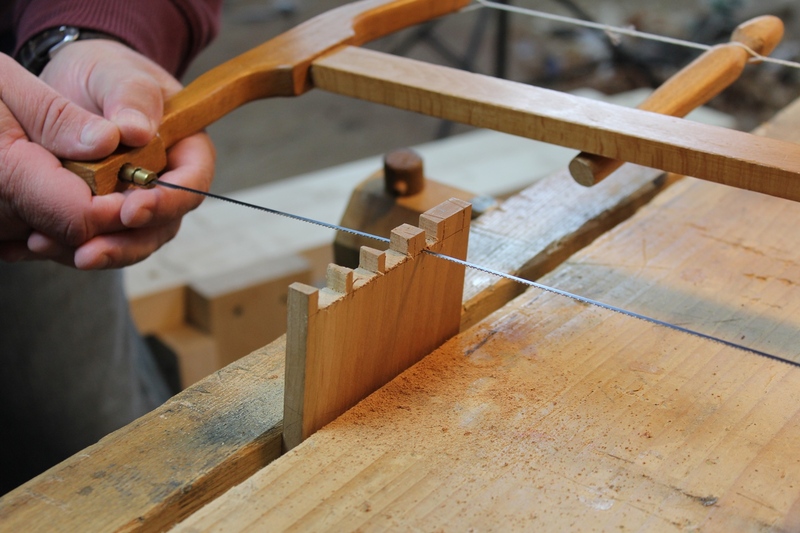 The waste between the pins of the through dovetails can be sawn out. I removed the majority of the waste from between the pins of the through dovetail with the turning saw. The remainder of the waste is then pared with a chisel. 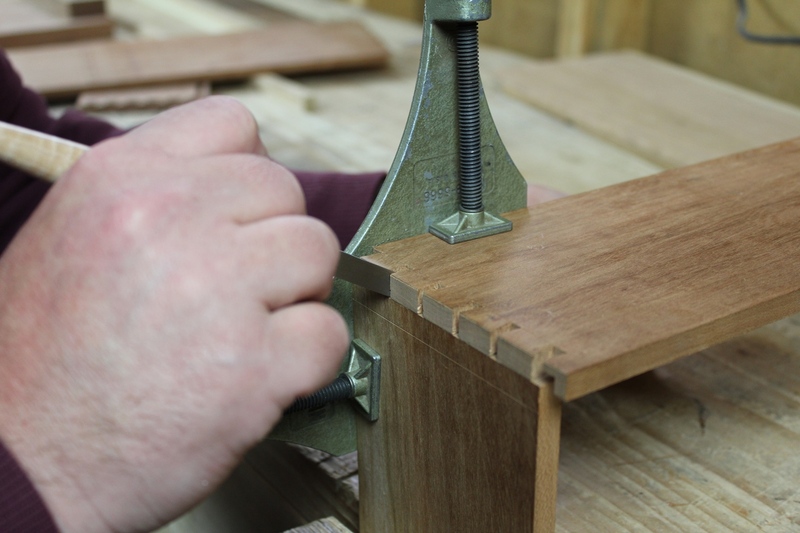 The waste between the pins of the half blind dovetails must all be removed with the chisel. A fishtail chisel is a total luxury, and certainly not necessary. But it does make cleaning out half blind dovetail sockets a breeze. 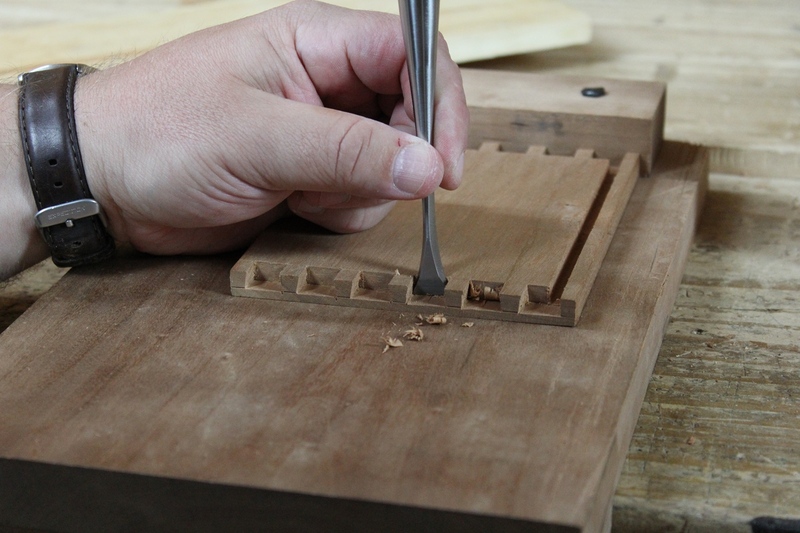 For the half blind dovetail sockets, all of the waste must be removed with a chisel. I chop the majority of it with a straight chisel, then use a fishtail chisel to clean up the corners. The fishtail chisel isn’t a necessity. 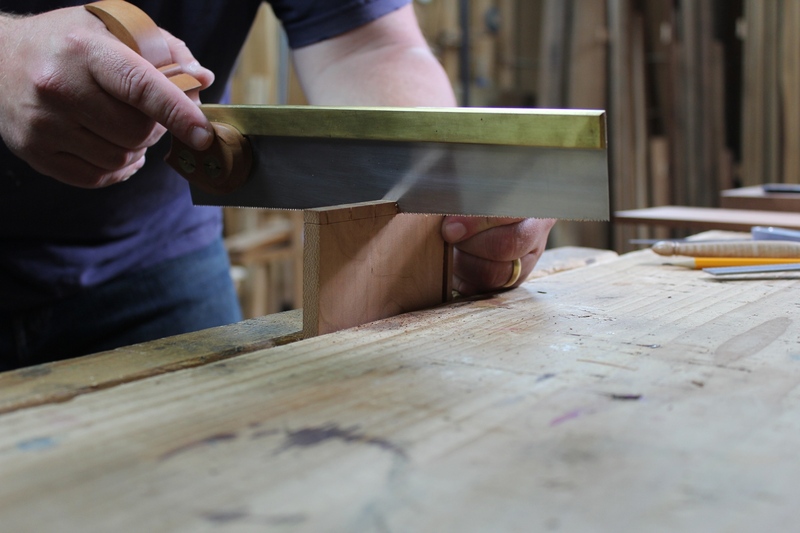 You can use a narrower chisel, or the tip of your marking knife. You don’t have to buy a commercial fishtail chisel either. They are easily ground from an extra 1/2″ chisel. Checking the diagonals of the assembled box to ensure the assembly is square. After adding glue, the four sides get fit together and I check the assembled box for square. The dovetails fit well enough that clamps are not necessary. Once the glue has dried, I’ll level the dovetails and move on to the back. Posted in Classes, Project Logs and tagged sliding lid candle box.